Shanklin Cafe has intrigued me for a while now with its crazy high rating of 4.9 on Zomato. After skipping out on brunching for a while, I decided that it was maybe time to restore my faith in what used to be my favourite meal of the day with a visit to Shanklin. The interior was right up my alley, being set in a restored Victorian style building, and a front yard that was perfect to bring your furry friend to. The inside was equally as pretty, carrying through the rustic use of exposed bricks, with a feature wall of blue and pink mosaic-esque tiles. It was quite a warm day, and my dining partner chose to have an iced latte. We were a little confused as to how this was served, with a shot of espresso coupled with a larger glass that seemingly already had some coffee in it. Regardless, it was an icy brew that gave the right amount of caffeine kick. My usual order of flat white was equally satisfying, being a dark roast that was easy to sip on. The portobello mushroom is said to be a must-order at Shanklin Cafe, and my friend was more than willing to try the dish, given her love towards mushrooms to start off with. The plate had a lot going on for it; the vibrant colour of the romesco sauce is what first stood out in the dish, which paired well with the earthiness of the juicy portobello mushrooms. The two poached eggs added sustenance, and the zaatar on both the mushrooms themselves and sprinkled over the top brought a Middle-Eastern touch. Although not marked as such, I think this was a vegetarian dish, and a substantial one at that. It’s always hard for me to say no when pork belly appears on the menu, and so it was a no-brainer to order the pork benny. The pieces of roasted pork belly was on the fatty side, which means that if you’re a eater of leaner cuts of meat, this may not be right for you. The hollandaise did prevent the dish from being too heavy though, and I did quite enjoy it. Did I enjoy my meal at Shanklin? Sure. 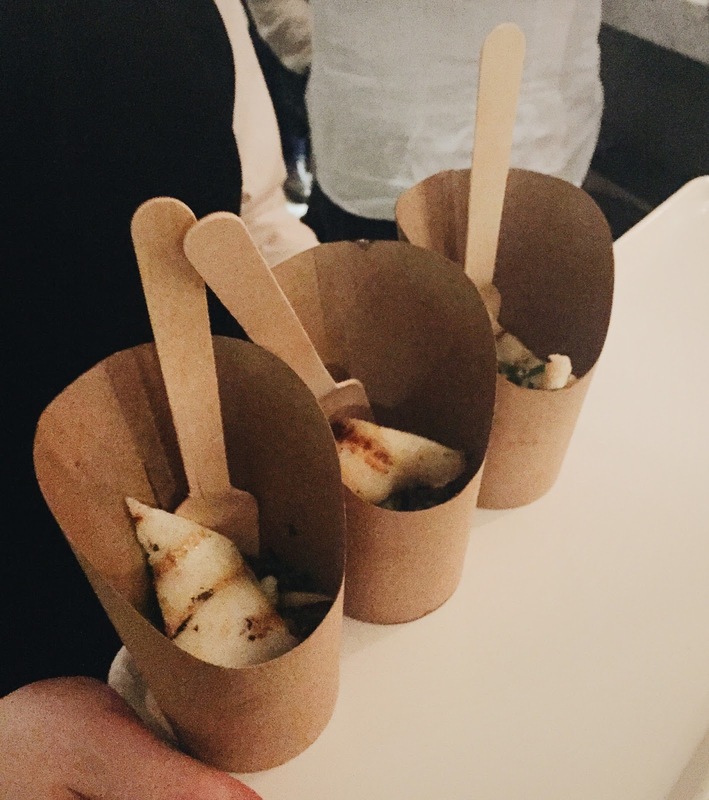 The food was hearty and classic, with innovative elements tied in. 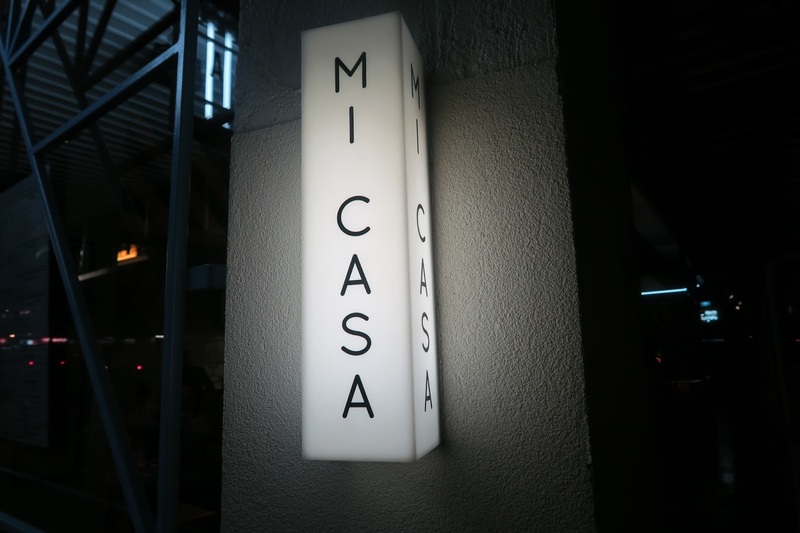 I did think that it was on the pricier side though, with most dishes being above the $20 mark, and if you were to order a drink too, the bill would easy rack up to around $30. That’s the thing with a lot of brunch places I think, not exactly over-priced, but not exactly bang for your buck either. Maybe I’ve just grown out of the brunch phase, but I can’t really justify that sort of spending like I used to. I mean I’m still going to indulge in it here and there, but it certainly isn’t going to be a weekly thing anymore. Oh well, c’est la vie. 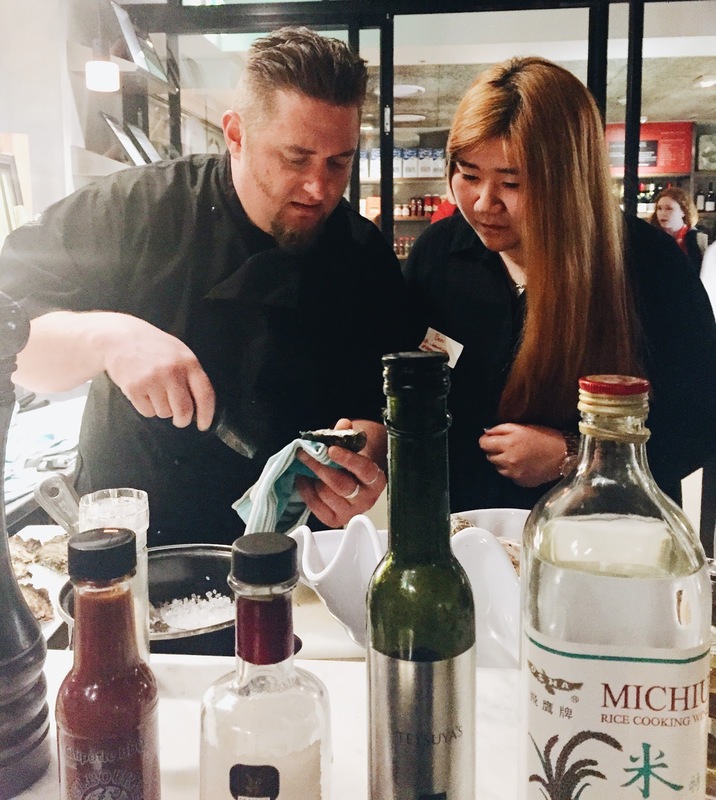 Shanklin is located on Tooronga Road, catch the #75 tram and get off at Tooronga Road/Riversdale Road, and the cafe is three minutes walk away. I’ve always been a bit iffy about Hawthorn, for some weird reason, there is never any signal when the train passes the station, and its proximity to Glenferrie, and the fact that half the trains during peak hour doesn’t stop here has always made it a bit of an useless station imo. 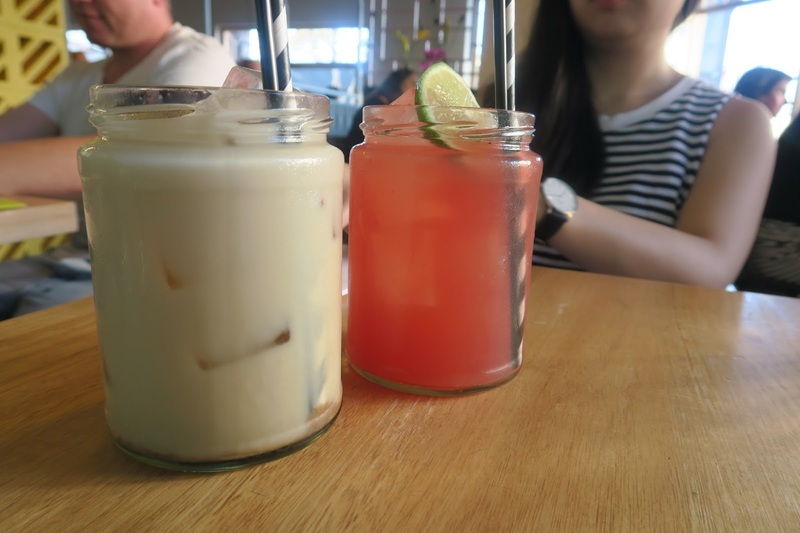 However, there is no denial that there are some decent cafes around the area, my friend works at an accounting firm down the road, and it only makes sense for us to have brunch at Hawthorn Common during her lunch break. I haven’t heard much about Hawthorn Common, but upon stepping inside, the open floor plan with ample amount of lighting has already piqued my interest. Since I already had a coffee earlier that morning, I decided to get something cool and refreshing, and the orange juice was exactly that. I usually don’t order something sweet for brunch, unless I’m sharing with a friend. The milk and honey waffles sounded quite restrained in terms of the sweetness though, and I decided to live life on the edge and went ahead with the order. The one-and-a-half slice of waffles was quite subtle indeed, although the waffles were quite dense, I really enjoyed the milk ice-cream with crumbed honey pieces. Although sweet, the waffles did not leave me feeling cloying at all, and I was pleasantly surprised actually. My friend was feeling like something sweet too, so here we are, having desserts for breakfast. The raspberry and rhubarb pancakes were quite sweet, however, the rhubarb sauce was quite acidic, which helped to balance out the dish. She also found the house-made roll ups on the top of the pancakes quite amusing. Hawthorn Common was bustling during our stay, and it’s not hard to see why. 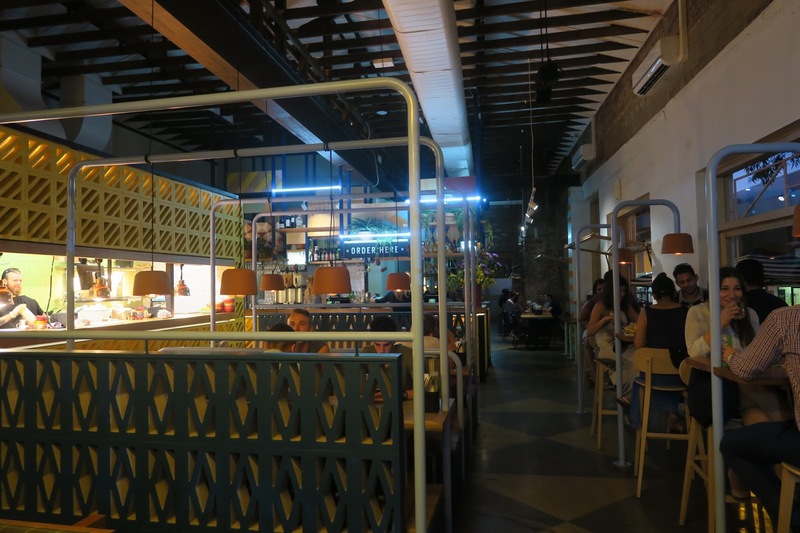 In a suburb where there are a numerous number of cafes, Hawthorn Common manages to standout through its succinct menu that’s studded with innovative dishes, as well as the inviting and luscious atmosphere. Since my visit a little over half a year ago, Hawthorn Common’s menu has changed it quite a bit, and the two things we ordered are no longer on the menu, however, the pavlova pancakes sounds pretty amazing to me! 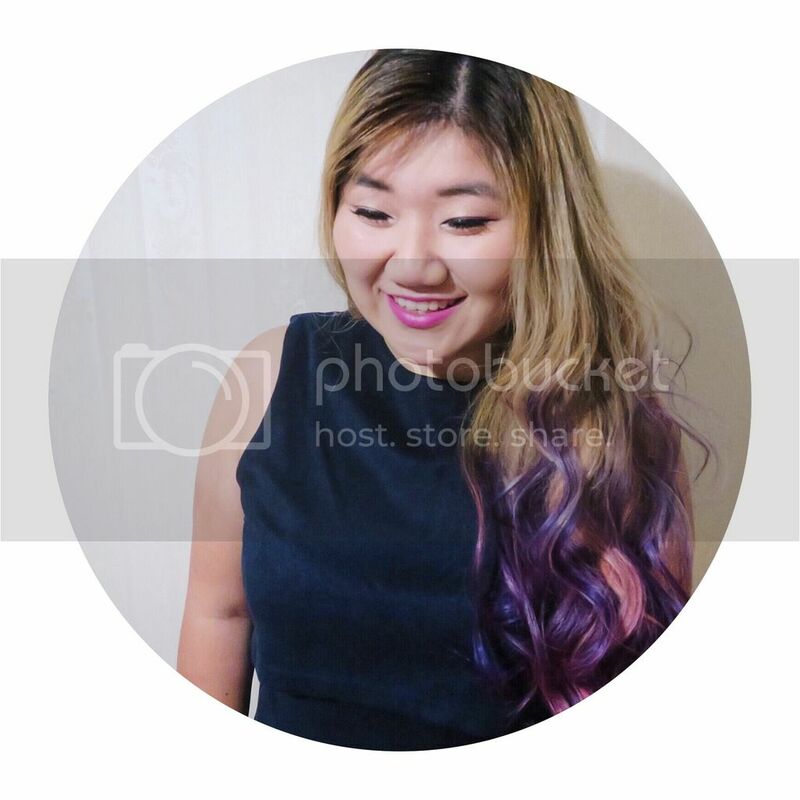 All the horrible myths you’ve heard about law school is true, hence the lack of posts for the last month, I never thought I was all that bad at time management, but that’s before law entered into my life. 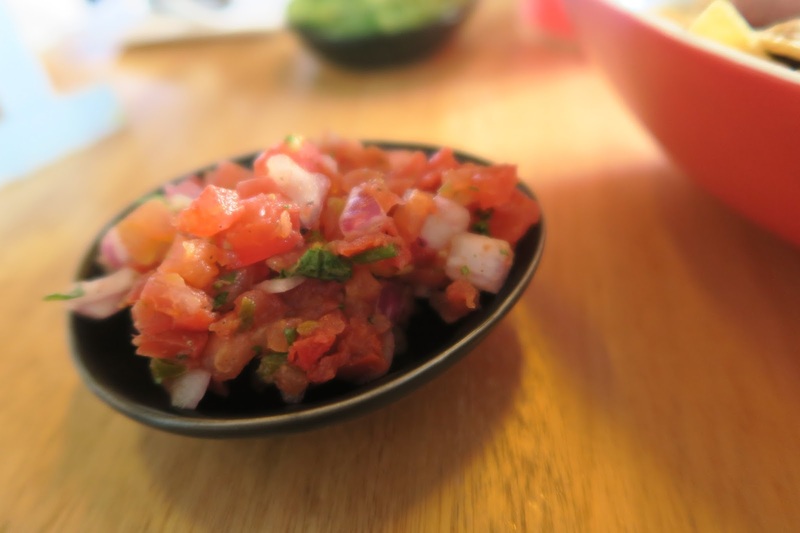 But that’s for another post, today’s one is going to be a long awaited restaurant review. 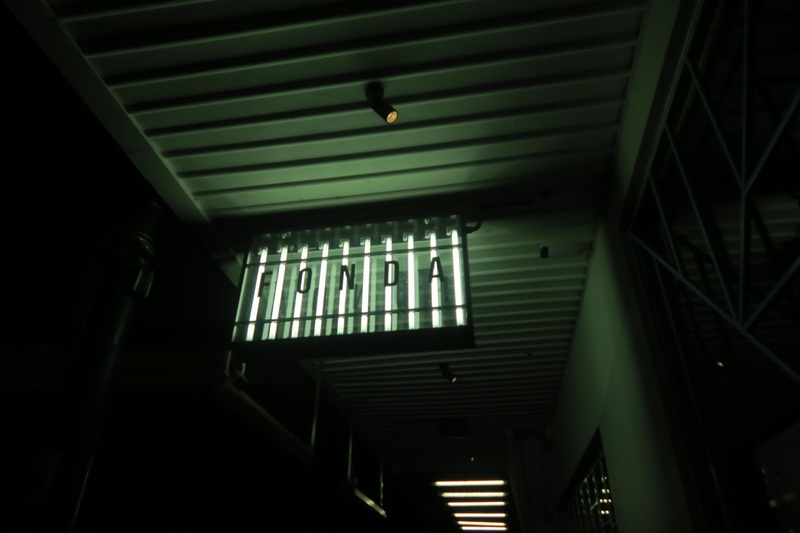 Fonda is a Mexican restaurant, its interior does not scream Mexican at all though. 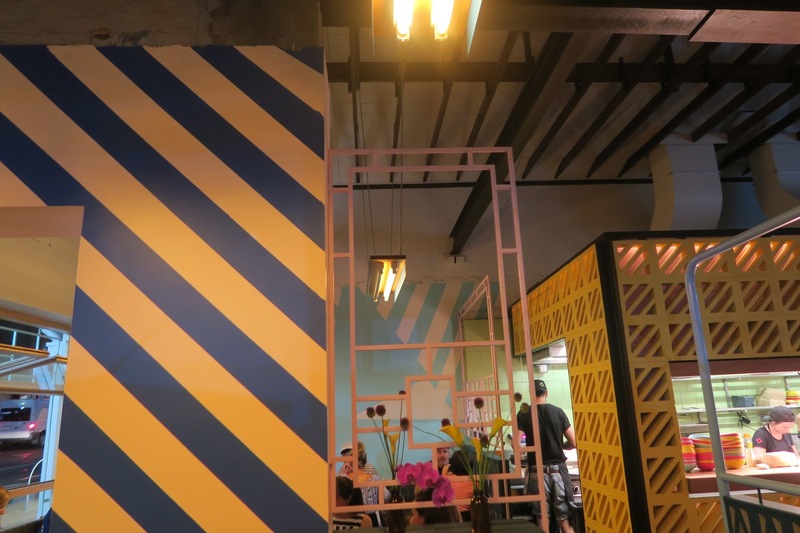 It’s got the industrial vibe going on with the use of pipes, and the yellow and black stripe which is reminiscent of those DANGER tapes that are thrown around construction site. However, there is also splashes of pastel colours throughout the restaurant. The high ceilings ensured that the place was filled with light, and overall, it felt inviting and spacious. 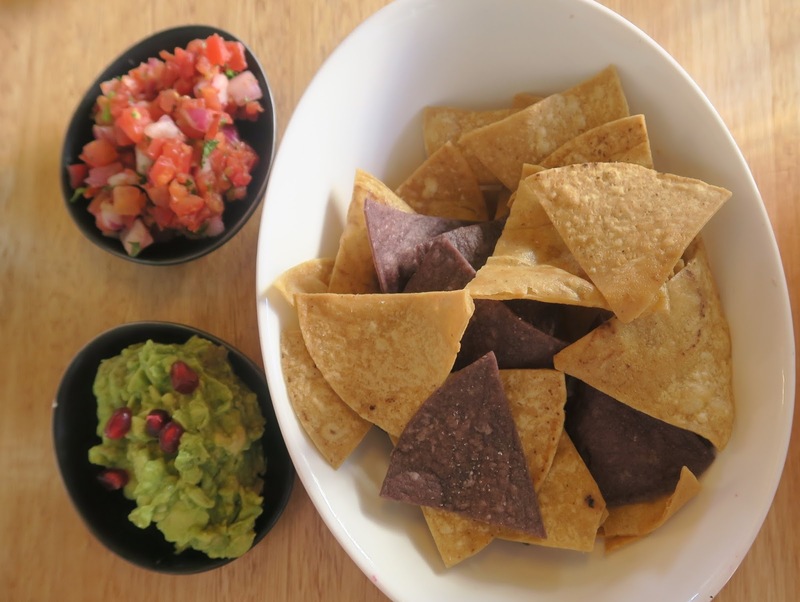 Being at a Mexican restaurant, we opted for the tortilla crisps over the chips, since you know, traditions. The two accompanying dips were both quite refreshing, though nothing extraordinary. The tortilla crisps were great though, they were thicker than your Dorito’s kind, and the crunch was on point. The blurple chips tasted the same as the yellow one, to my disappointment, but hey, that doesn’t take away from the novelty. This was my first time trying a Horchata, and I gotta say, it’s pretty awesome! It’s a traditional Mexican drink made with evaporated milk, rice water, cinnamon and vanilla. The cinnamon flavour was quite prominent, and if you love cinnamon, then you’ll love this. The closest thing I can think of is a cinnamon flavoured milk tea, which I’m pretty sure isn’t a thing. The watermelon and strawberry was pretty standard in comparison. Don’t get me wrong, it was still nice and perfect for a warm Summer night. Watermelon and strawberry is such a classic combination, and both fruits could be tasted in this drink, which is always nice. 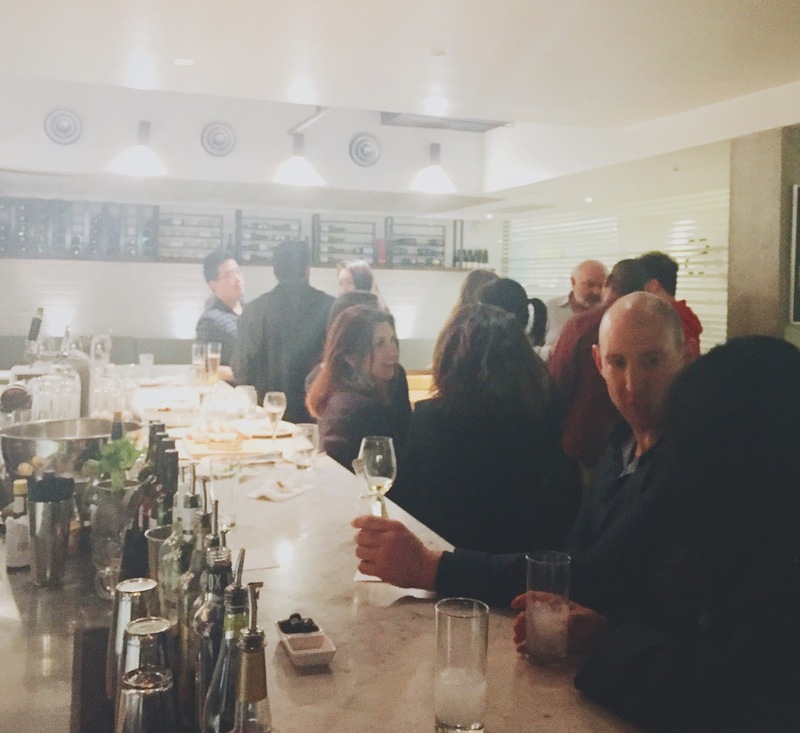 Moving onto the more substantial offerings of the night, we decided to share a couple of things to test out the menu. First off, we got the chopped beef burrito. 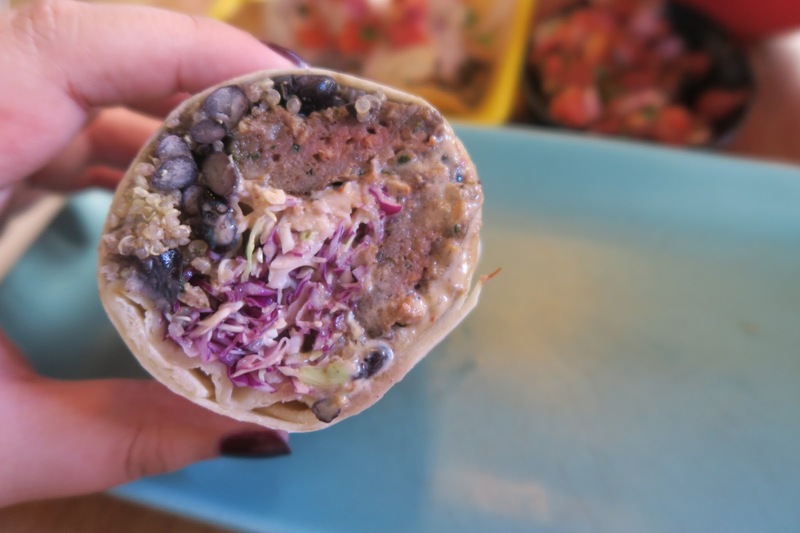 Fonda takes a lighter approach with their burritos, filling it with toasted quinoa and black beans, rather than rice, the usual carb of choice. 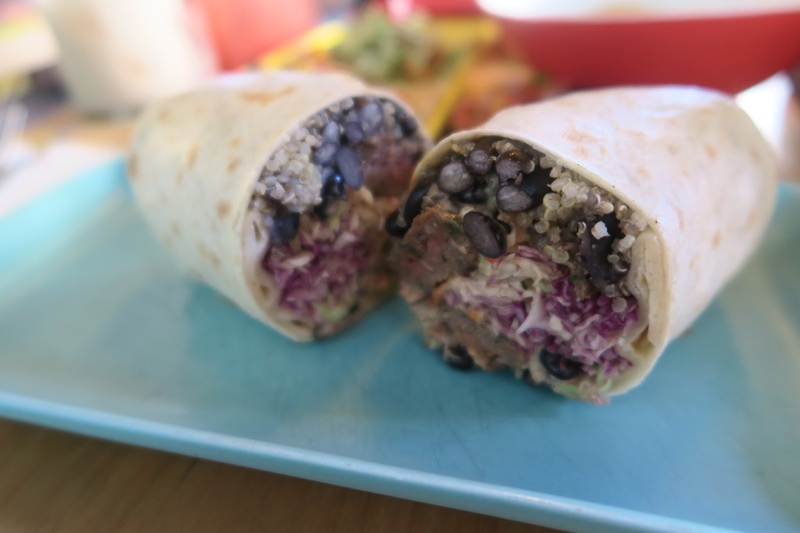 This is probably the best burrito I’ve had, the beef had so much flavour, and were perfectly pink in the middle, which means that it was nice and juicy. The salsa added some nice acidity to the burrito, and the chipotle aioli tied the whole thing together. Seriously, less calories and delicious, what more could you ask for? 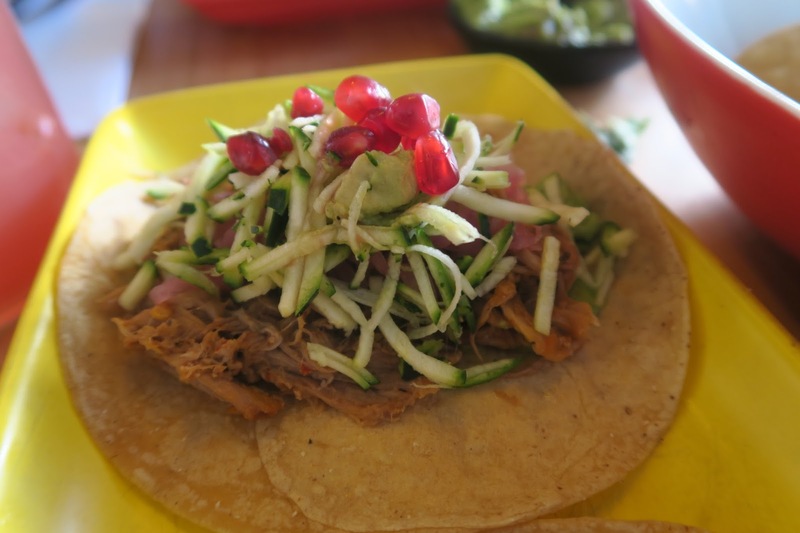 The tacos were equally as delicious, the pulled pork was tender and flavoursome, and the pomegranate added some sweetness and texture to it. 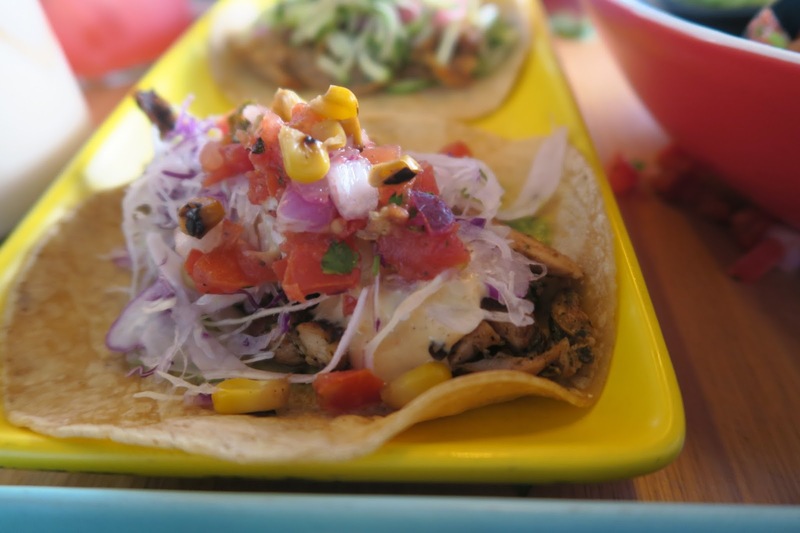 The chicken adobo was a lot more punchy in flavour, with ancho chilies, chipotle aioli and pico de gallo thrown into the mix. The charred corn did cool the heat down a little, and overall, it was a delightful combination. After visiting Fonda, I completely get why people are always raving about it, and how quickly they managed the expand their Mexican affair. Mexican food that doesn’t leave you feeling greasy afterwards? I’m always down for that. 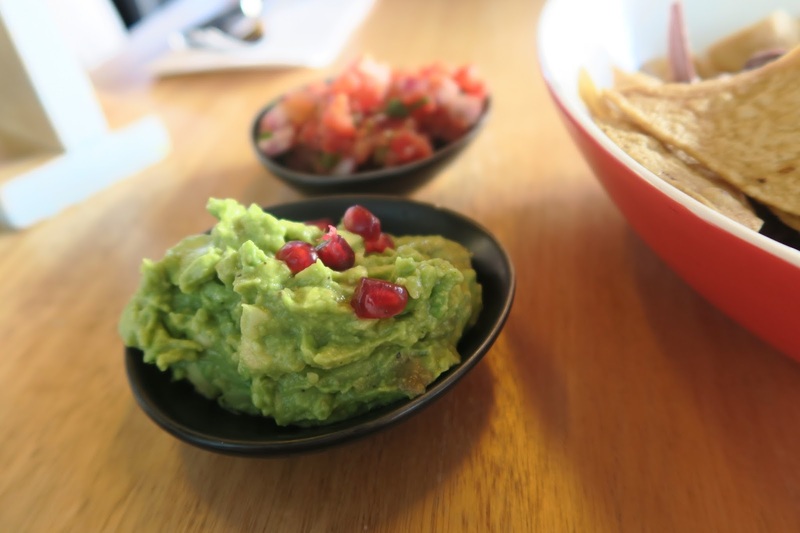 I went to the Hawthorn location of Fonda, which is on Glenferrie Road, a short five minutes walk from Glenferrie station. Other locations include Windsor, CBD, Richmond, and Knox City. Merry Christmas everyone! I should have some seasonal posts coming up, but no promises. 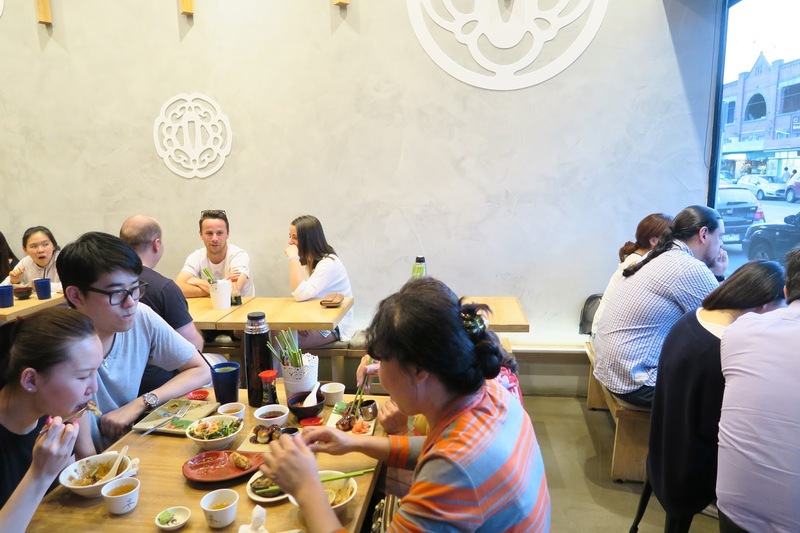 Back to today’s post, Samurai looks like your standard minimal style Japanese restaurant from the outside, with plenty of natural light to make the small space bright and welcoming. 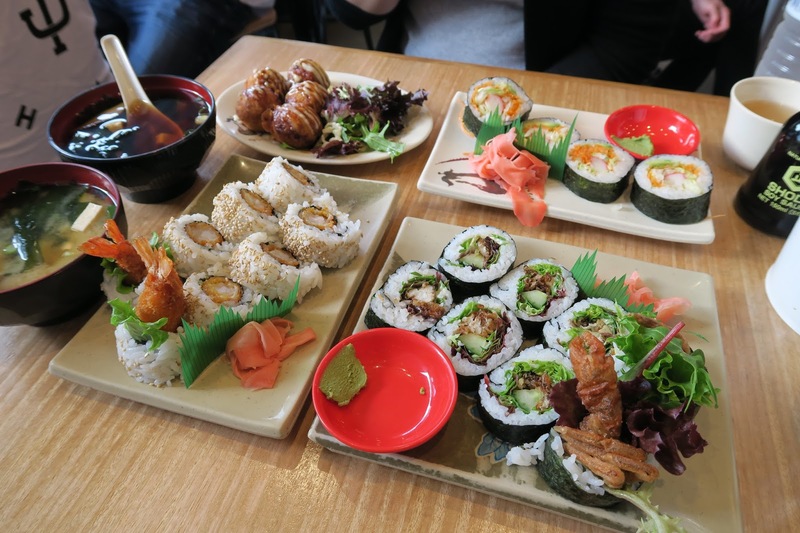 Most people go for the $16 set menu here at Samurai, since that gives you the most value for money, and my friend and I decided to get a set each, and share everything. 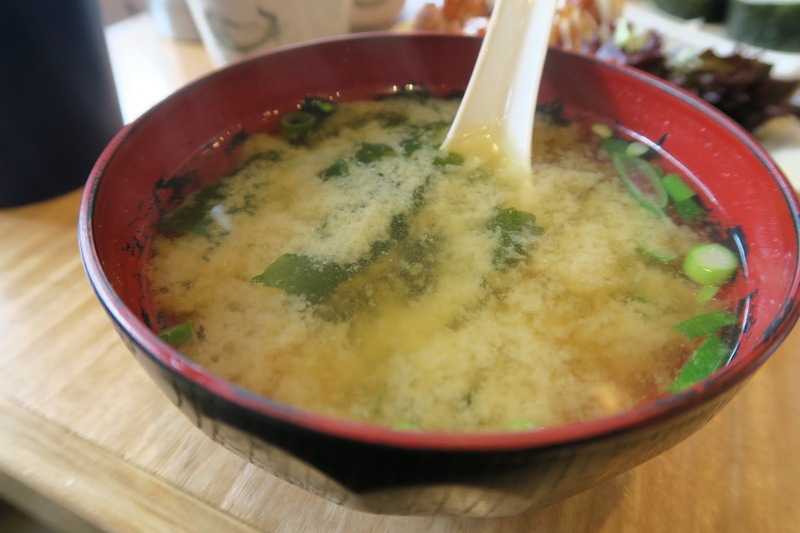 The murky soup were placed in front of me in no time after we ordered, the soup was pretty standard, but I did like the pieces of tofu that are not visible in the photo, due to the cloudy miso. 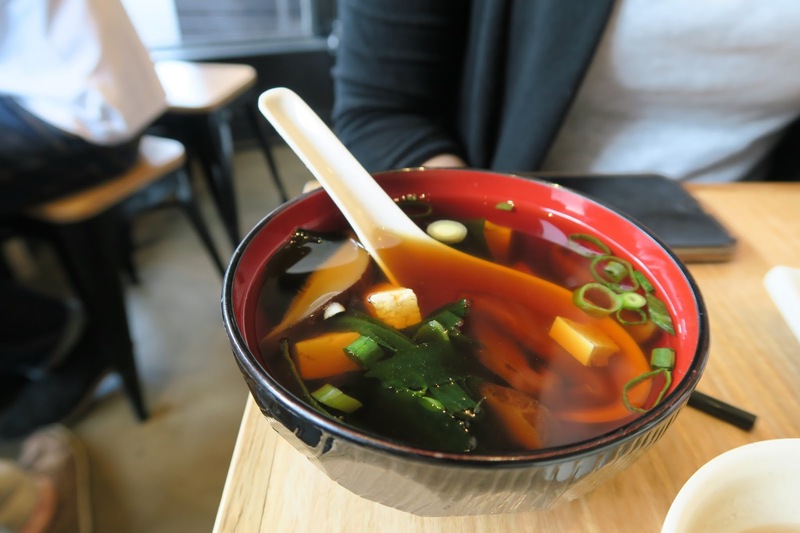 My friend went for the Osuimono soup, a clear broth with mushrooms, seaweed, and tofu. The soup was a lot lighter, and quite refreshing. The milkshake was $1 extra for the set, but I had to see what the hype was all about. 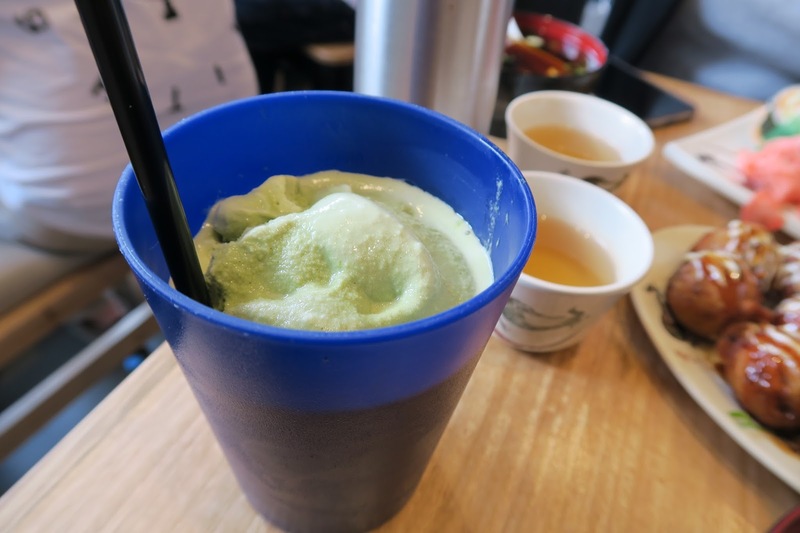 Like everyone before me has said, it’s pretty much green tea ice cream in a cup, as it melts, it becomes easier to sip on. The takoyaki were piping hot, however, there was barely any boniko flakes, which I guess was made up with the ample amount of sauce. 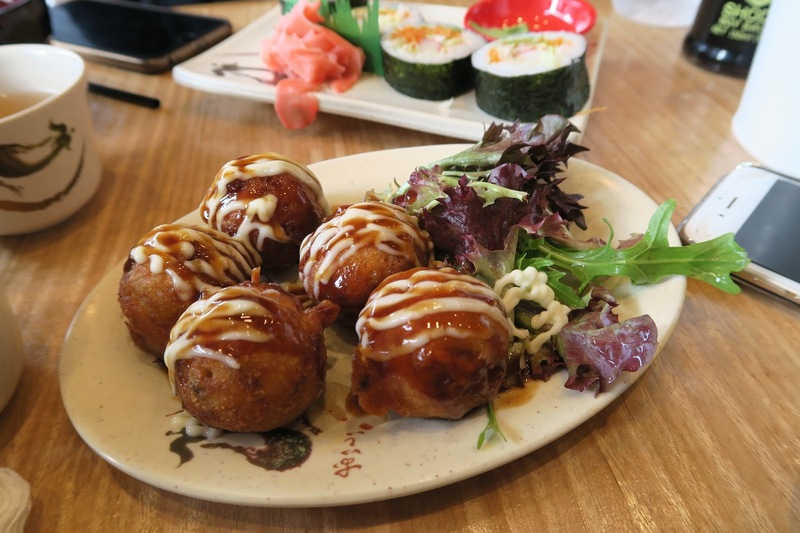 There were some small pieces of octopus in the takoyaki, and they were very satisfying. I was surprised to see the shredded carrots in these – clearly didn’t read the menu properly – which I didn’t get them a go. 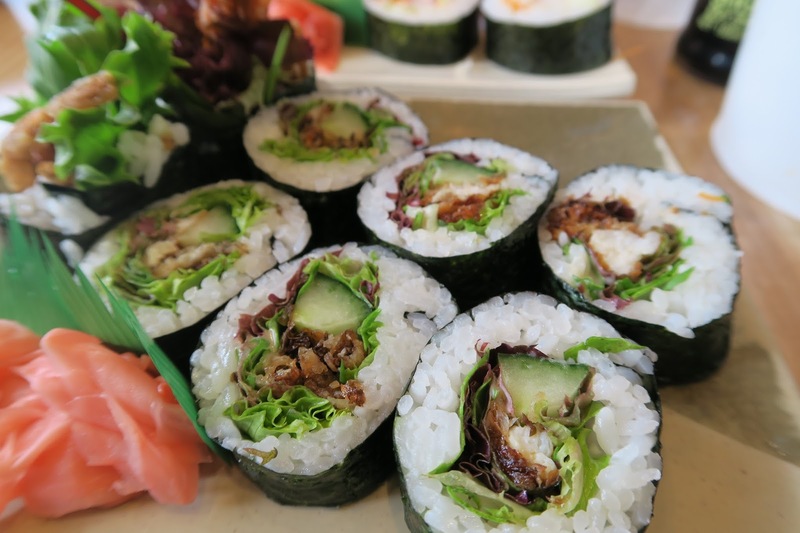 My friend did say that it was your average California roll, but it was very fresh. 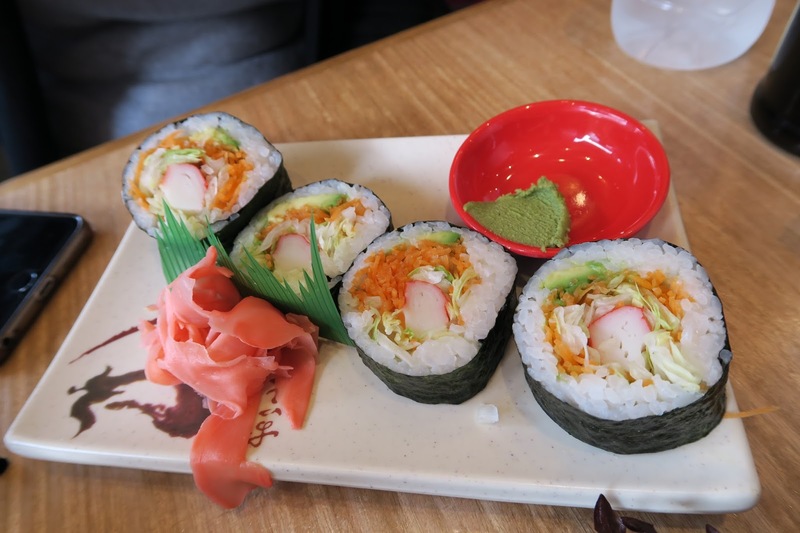 The spider roll had lettuce, cucumber and soft shell crab inside, however, there was mostly batter for the soft shell crab. The rice had a great texture though, and just the right amount of vinegar. 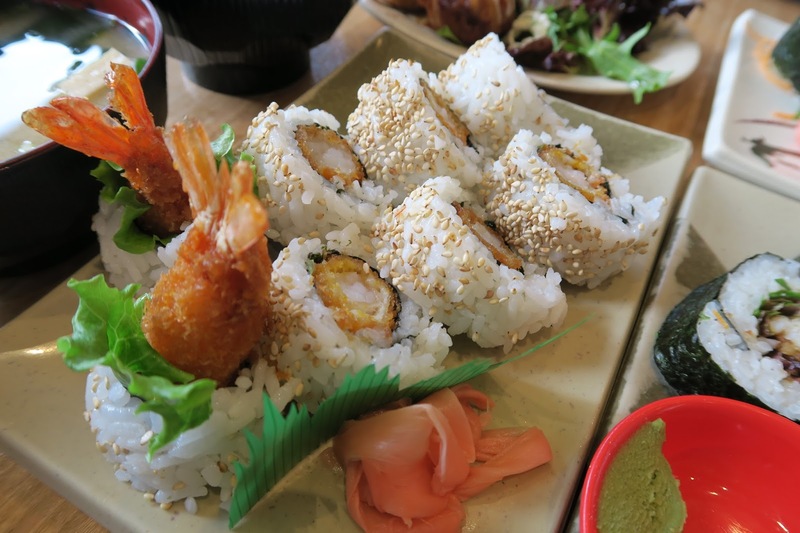 The prawn rolls were inside out, and only had crumbed prawn inside, the prawn were juicy and tender, and the sesame seeds added a nice nutty flavour. Is Samurai amazing? Not in my opinion. I mean, don’t get me wrong, there was nothing wrong with the food, but at the same time, they are around the same quality as things you would order in a food court. It is clearly very popular though, with a line outside waiting when we finished. 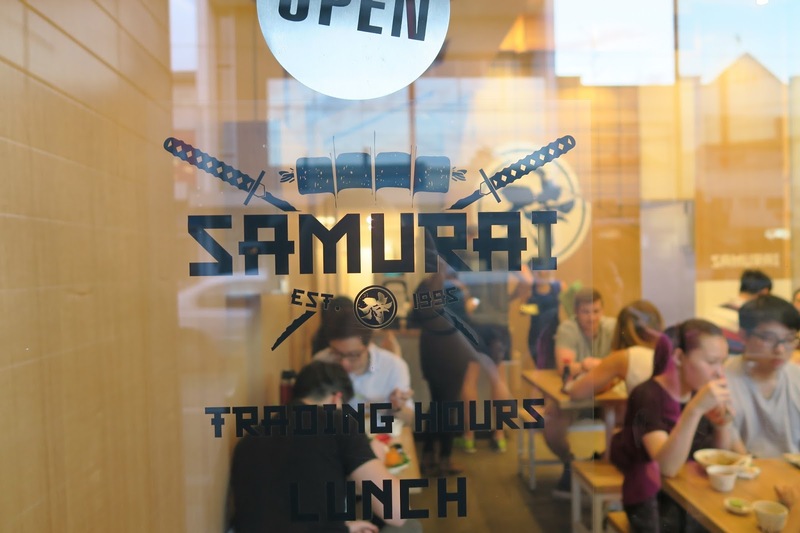 Samurai is located on Glenferrie Road, 5 mins down the road from Glenferrie Station. SOS Charcoal Seafood is a new restaurant on Glenferrie Road, which my friend pointed out has actually got quite a few great restaurants, must visit more often! 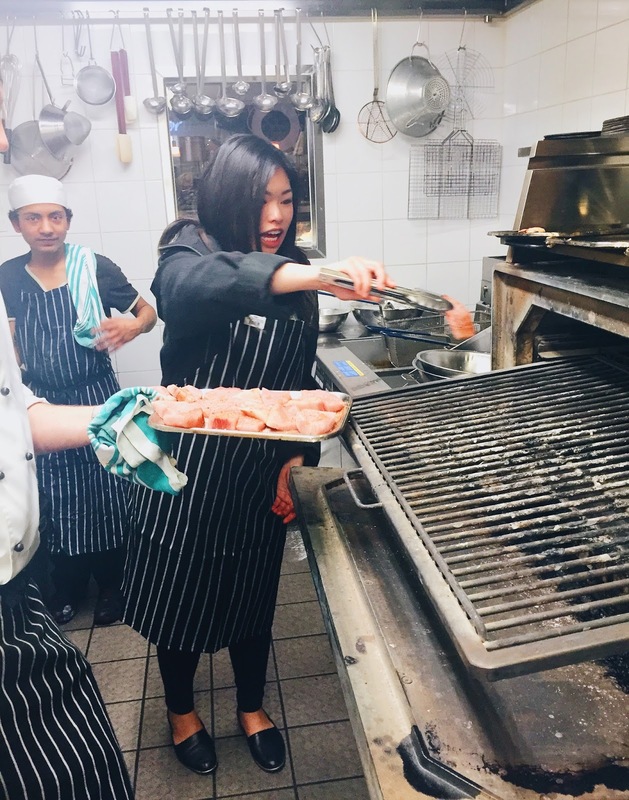 George, the owner of SOS Charcoal Seafood explained to us that the restaurant specialises in all forms of seafood, and features the use of a charcoal oven, which can heat up to 1000 degrees! 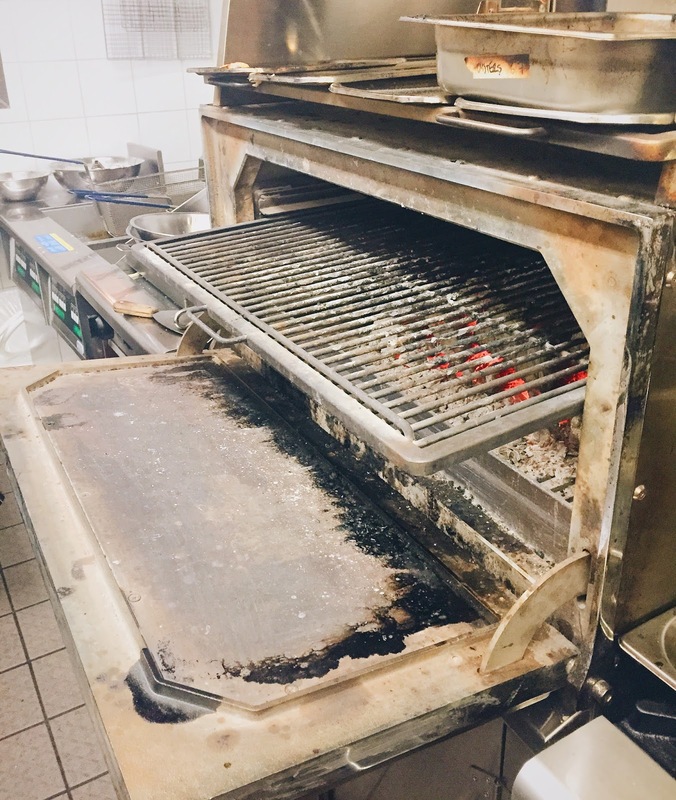 Because of the hotness of the oven, no oil is required, resulting in healthy and delicious seafood. 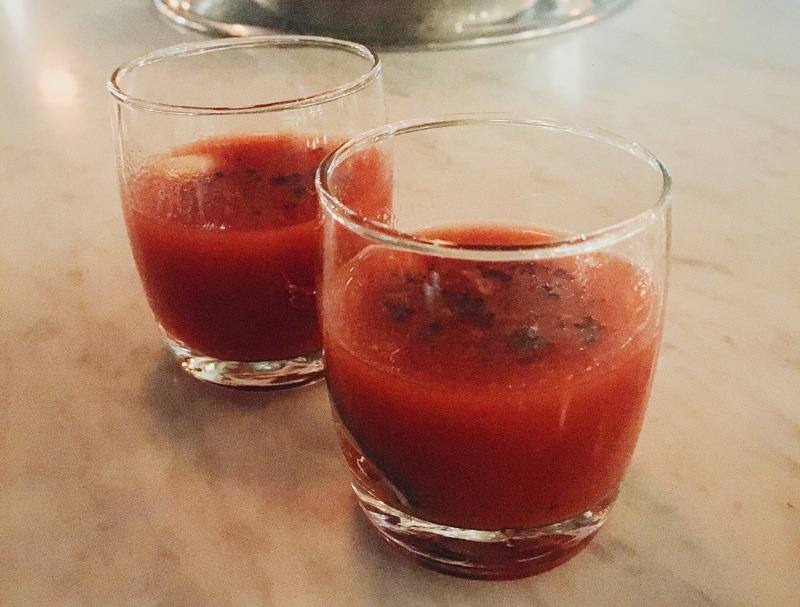 I was lucky enough to be invited to the most recent Zomato Meetup at SOS Charcoal Seafood, and I had such a blast mingling with my fellow foodies over some amazing Bloody Mary Oyster Shots! 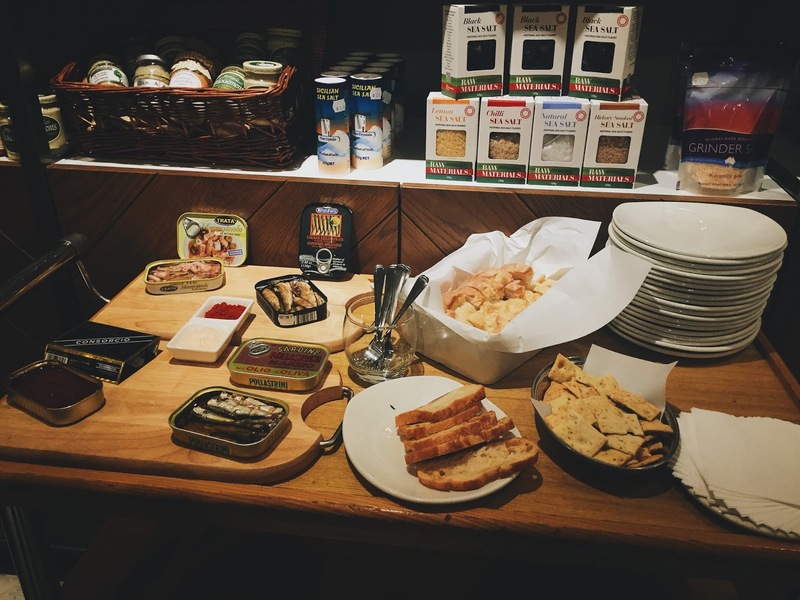 We started at The Fish Shop, where there were four types of tin can seafood being served with some bread. 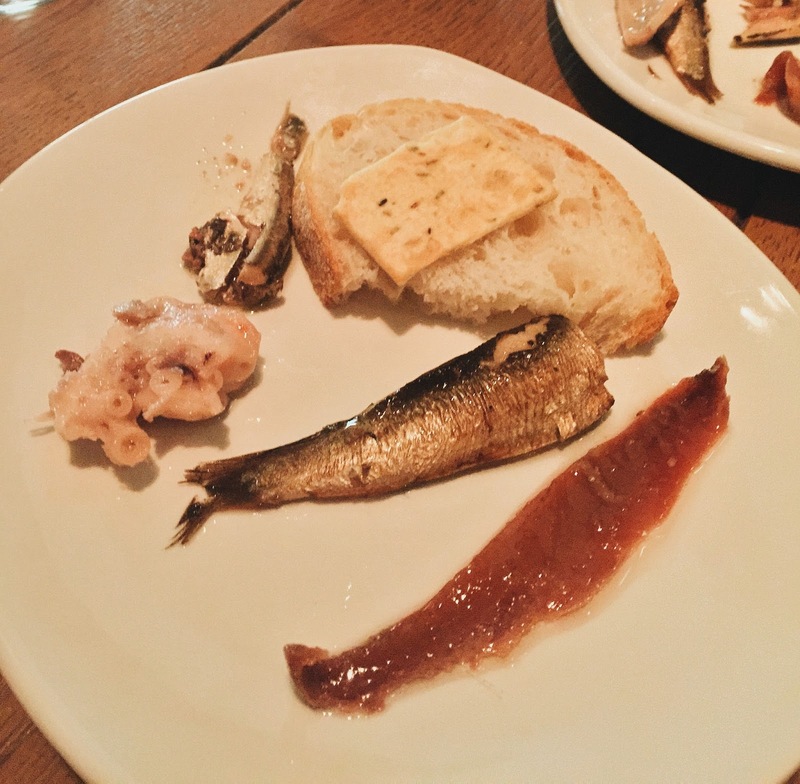 The anchovy was a surprise favourite, briny and fatty, it paired perfectly with the bread! 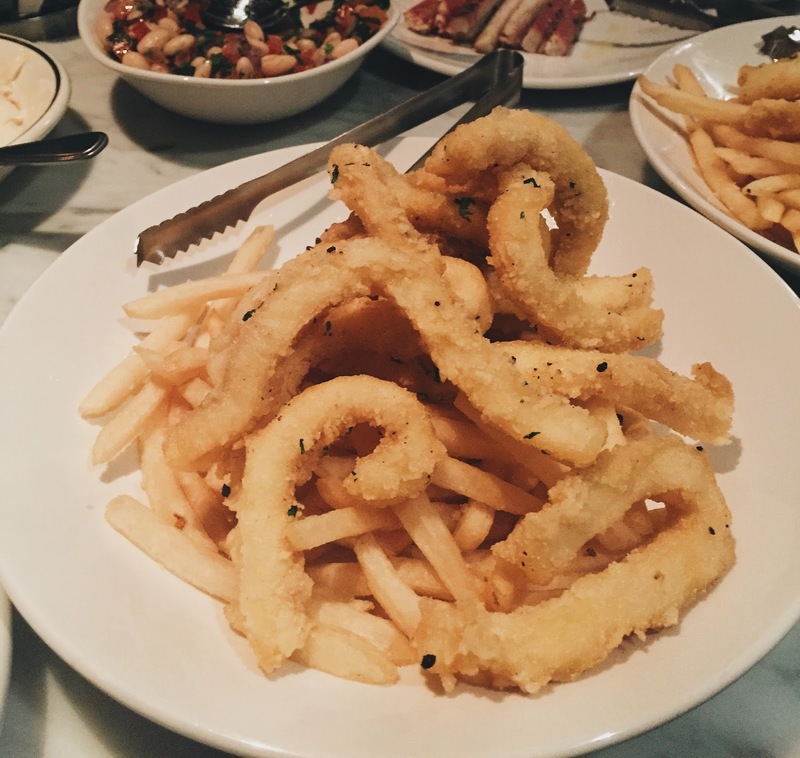 The calamari strips were very fresh and was fried to perfection! A light seasoning of pepper was all that was needed to enhance the flavour. 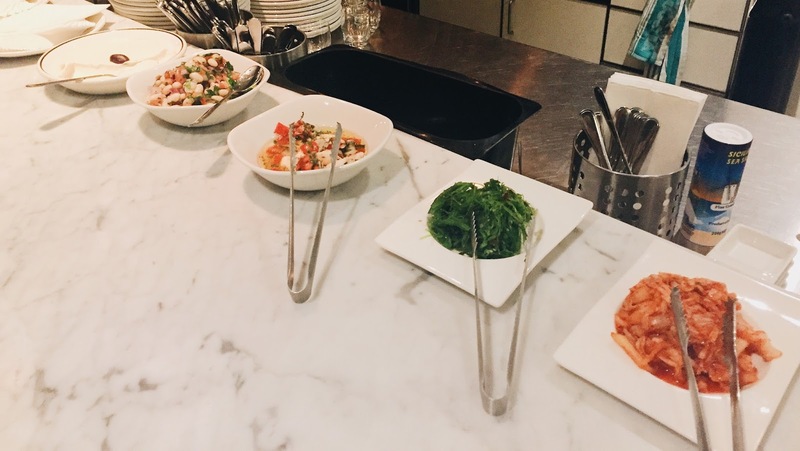 I really liked the white taramosalata, which was milder than traditional taramosalata. The pickled octopus was acidic and quite a palate cleanser. 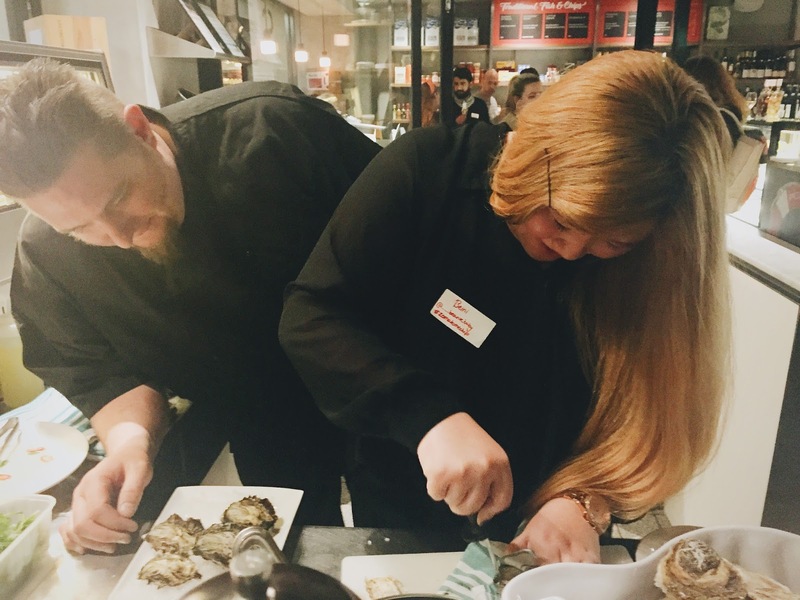 There was a oyster bar set up for us to have a go at shucking some oysters on our own, and I gotta say, it is so much harder than it looks! After some help, I was finally awarded with some yummy oysters! 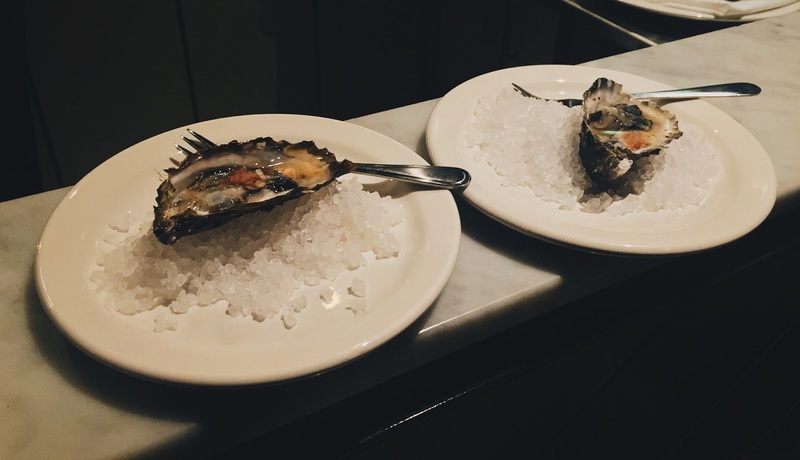 The freshness can be tasted, and it was probably some of the best oysters I’ve ever had! The octopus was again, grilled perfectly. 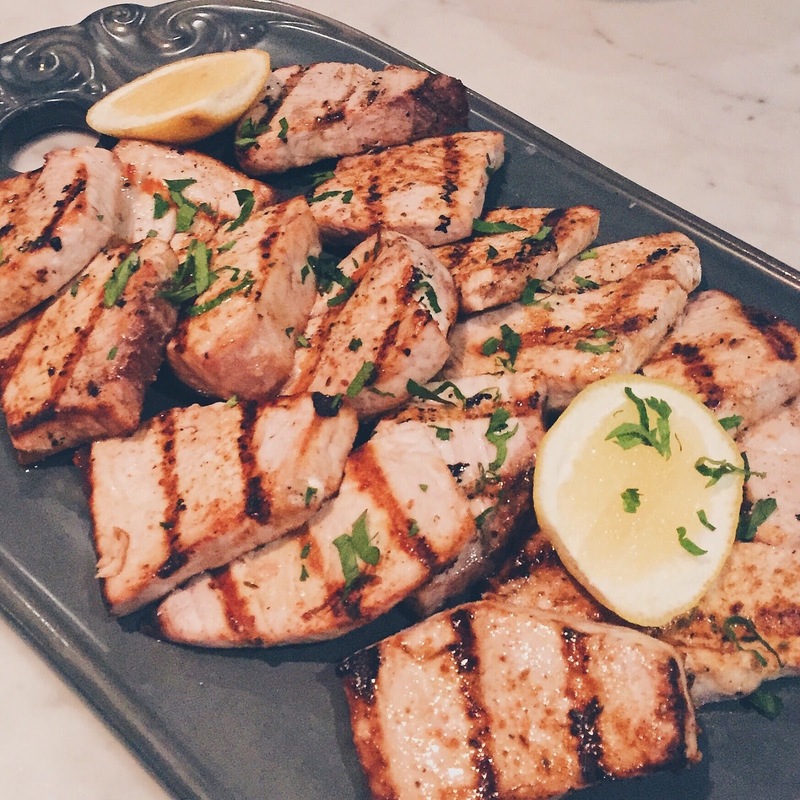 It was marinated in herbs and spices beforehand, thus having a distinct herbaceous flavour. 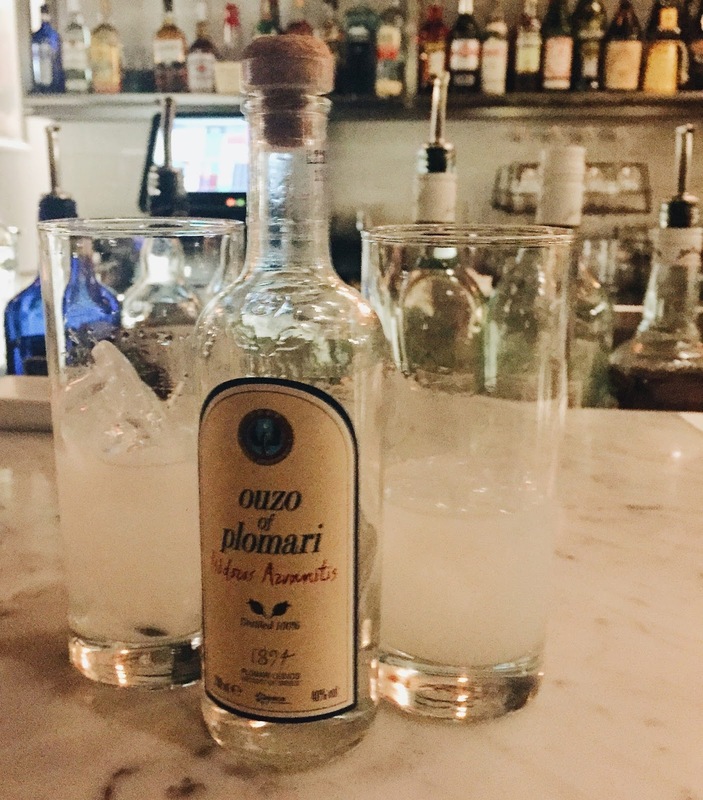 Apparently this is what the Greeks sip on while eating seafood, but it had a strong licorice flavour, which I’m not a fan of unfortunately, so I could not appreciate the drink. 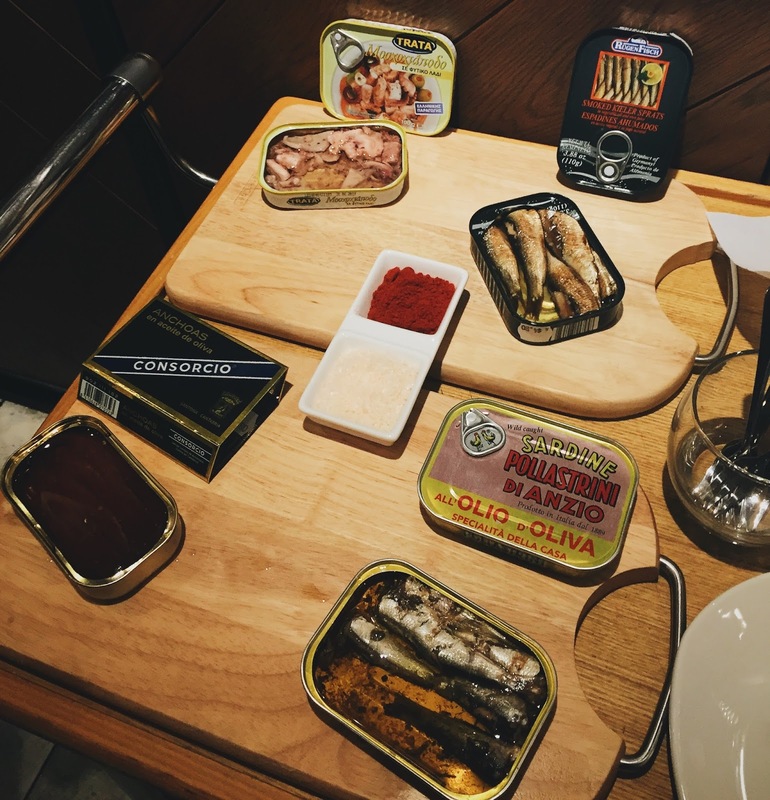 And then it was time for some more DIY, this time we were grillin’ up some fish! 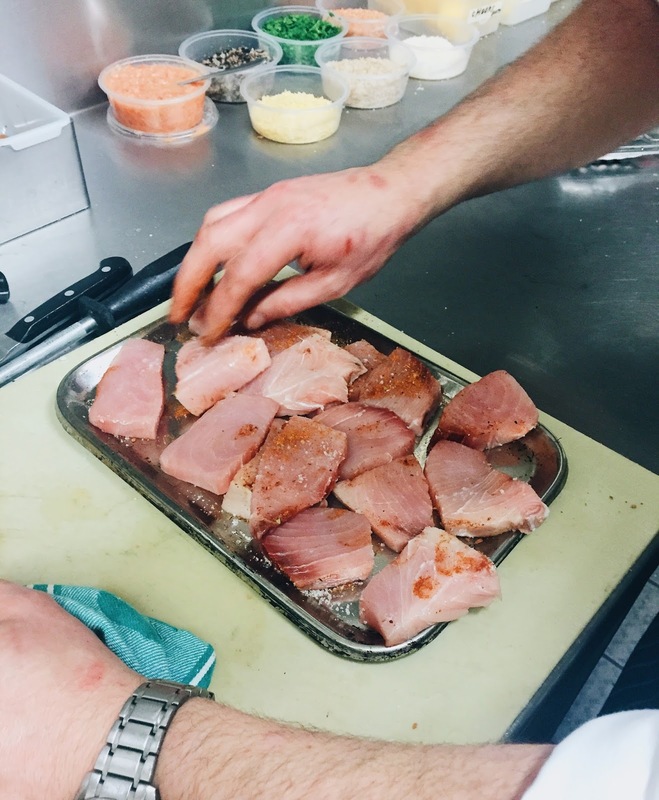 Chef Justin prepared the swordfish for us beforehand, and simply seasoned them with sea salt and cajun seasoning. This is the finished result! The fish only needed three minutes to cook in the oven, and the final dish was quite delicious if I say so myself! 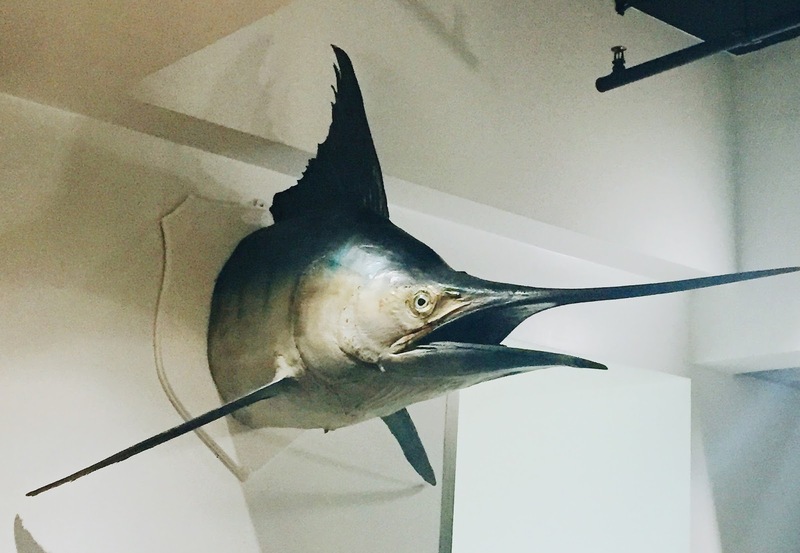 The swordfish was plump and tender, and the subtle seasoing allowed the freshness to shine through. Eugene and Jenny cooked up these treats for us next! 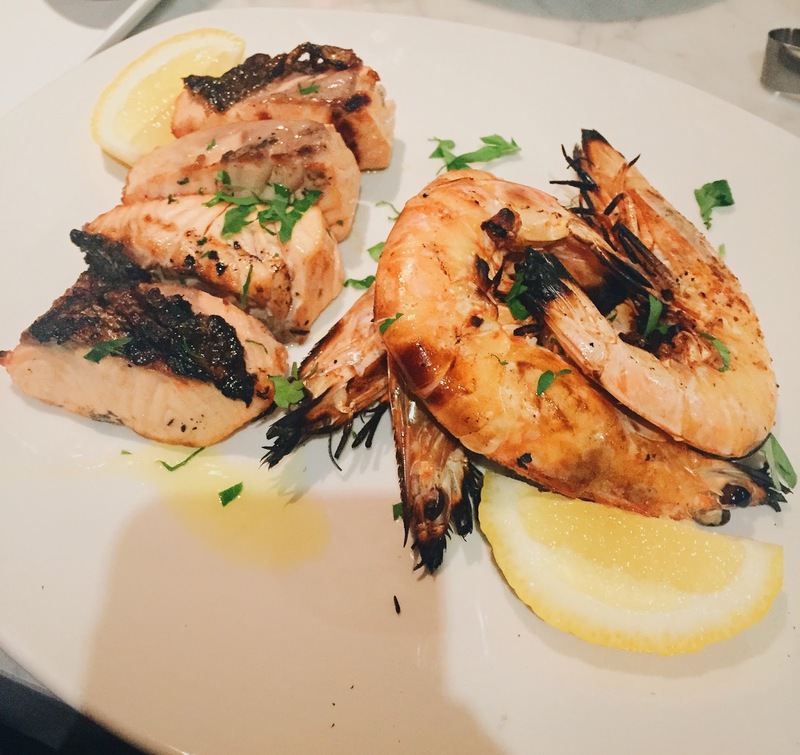 The crispy skin on the salmon stole my heart, and the freshness of the succulent king prawns amazed me yet again. 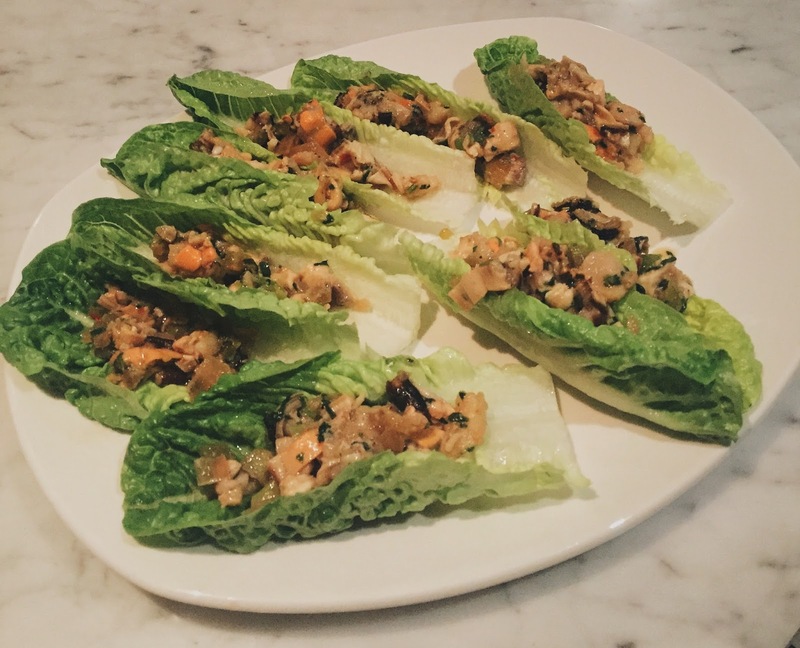 Neat little green lettuce cups were filled with oysters, mussels and scallops I believe, the mixture was seasoned perfectly and the plumpness of the seafood went well with the crispy lettuce leaves. Why are the bananas black? It’s to hold the banana together when they’re being grilled! 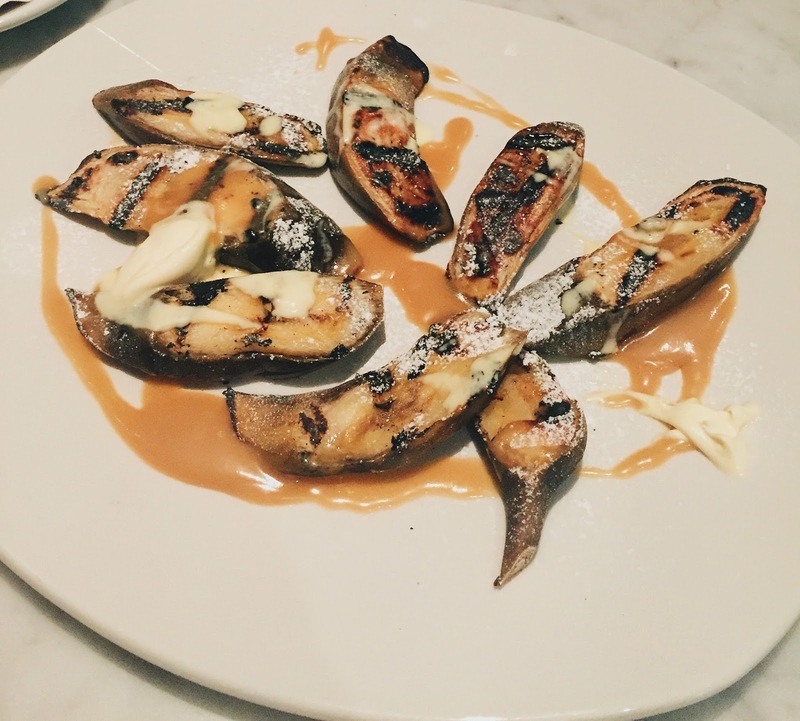 Because of the lack of natural sugar in bananas, although there were char marks, there were no caramelisation, the butterscotch sauce did lend some sweetness to these bananas! 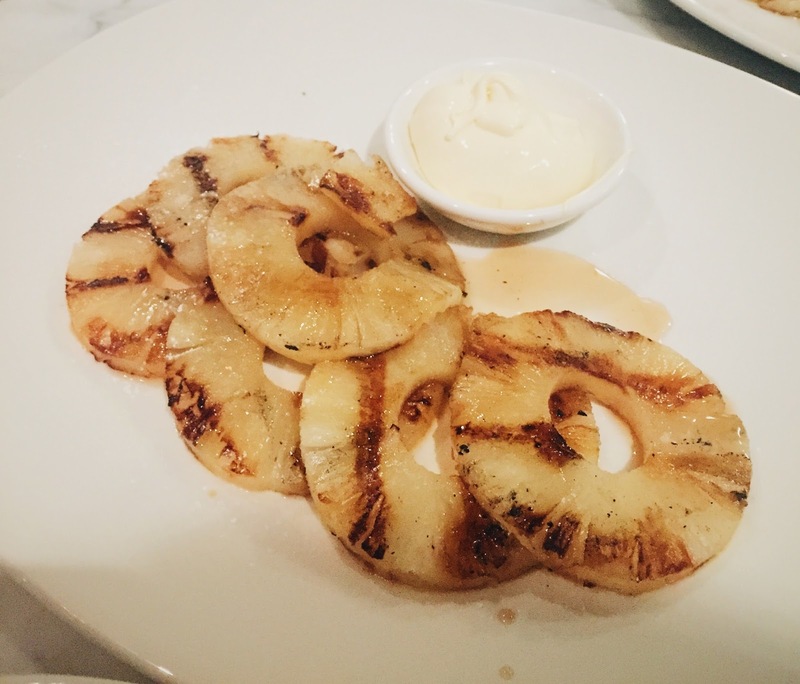 These pineapples, on the other hand, were much sweeter, and won my pick for dessert of the night! 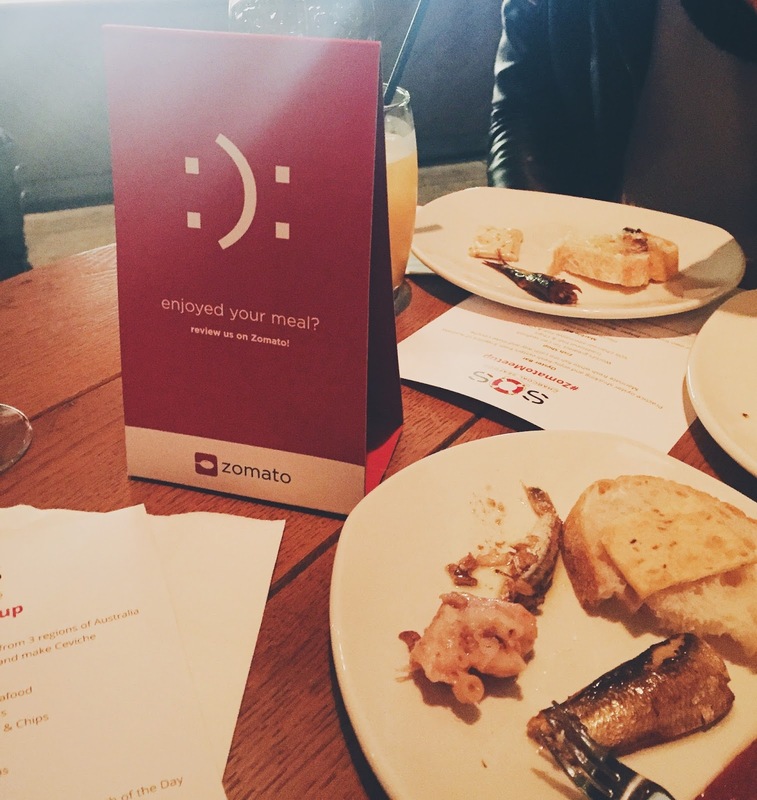 Good food, good people, what more do you need? I’m extremely thankful for this opportunity to not only enjoy some great seafood, but also meet people who are also passionate about food, coffee, Masterchef (minute of silence for Reynold please), Game of Thrones, House of Cards, and so much more! 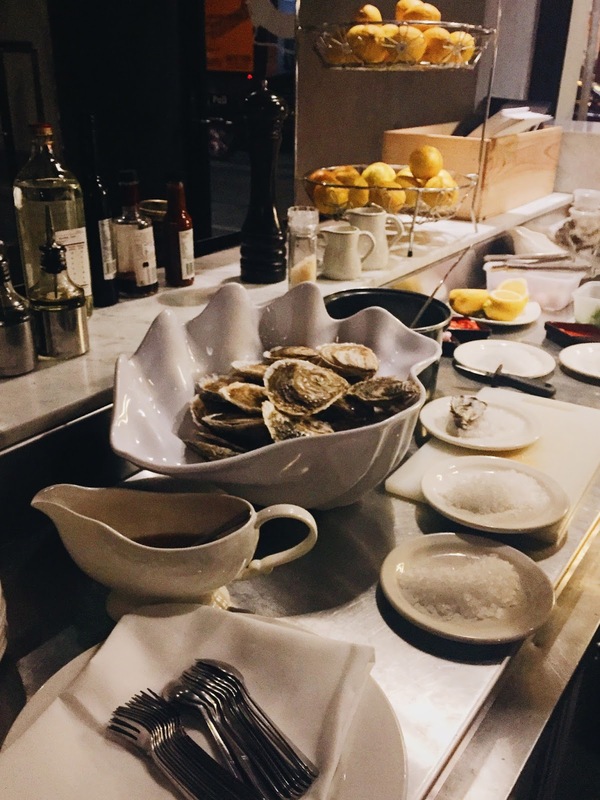 SOS Charcoal Seafood serves up some of the freshest seafood I’ve ever had, and the simple use of the charcoal oven as the primary cooking appliance allows the seafoods’ natural flavours to shine! Simplicity at its best, this is the prime example of less is more. I’m already planning my next visit to order some fresh fish and chips from The Fish Shop! 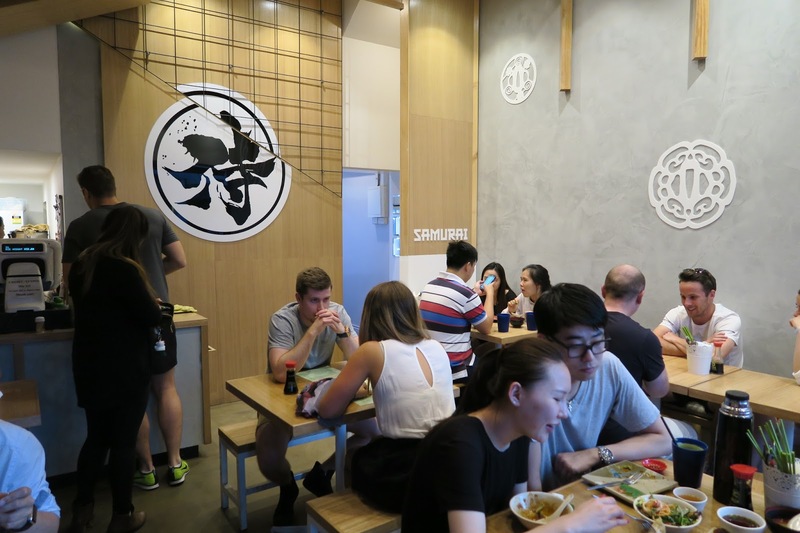 SOS Charcoal Seafood is located on Glenferrie Road, a short five minutes walk from Glenferrie Station.